Road safety professionals seeking recognition for their auditing and inspection experience now have access to a global credential program administered by the International Road Federation. Candidates are required to take an online knowledge qualifying exam and submit a comprehensive application presenting their professional track record and details of the projects they have audited in order to complete the program. 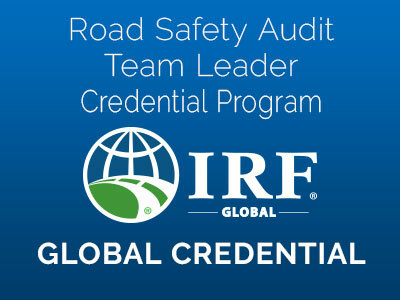 If you are an accomplished road safety professional with experience leading and directing cross-functional road safety audit teams, then the IRF Global Credential for Road Safety Audit Team Leaders is the right choice for you. You must meet the standard requirements outlined in the IRF policy statement “Requirements for Road Safety Audit Team Leaders” available from https://www.irf.global/policy-statements/. Please note that for purpose of these standard requirements, a “Road Safety Audit” is understood to mean a Road Safety Audit and/or a Road Safety Inspection. You must complete a Qualifying Knowledge Exam comprising forty randomized questions ventilated across four categories: the Safe System Approach, the Theory and Practice of Road Safety Audits, Road Safety by Design, and Case Studies. You will also be asked to submit Qualifying Professional Experience by completing three audit briefs comprising a scheme description, illustration of problem identification & solving, and have these attested by a verified third party. These briefs will be evaluated by an independent third party contracted by IRF. Your Global Credential is valid for a period of two years from the time it is issued to you. Discounts are available for IRF members and multiple applications submitted by one organization. By submitting their application, the applicant acknowledges that the IRF will apply the internal standards adopted by its Board to evaluate the applicant, and that it may reject any applicant who does not meet its minimum standards for certification. In consideration of the IRF’s acceptance and processing of an application, the applicant agrees to waive any and all claims of liability or responsibility against the IRF and to indemnify and hold harmless the IRF, its directors, officers, committee members, employees, agents and representatives against any and all such injury, damages, or claims made by or on behalf of any person, partnership, government, association, or corporation. The applicant further acknowledges that the IRF, its directors, officers, committee members, employees, agents or representatives are not liable to the applicant, or to any other person, partnership, government, association, or corporation, in any way for any injury, damages, or claims alleged to be based upon or arising out of the approval or disapproval or the issuance, withdrawal, or termination of any certification issued by the IRF. The IRF reserves the right to change or amend the requirements for certification if and when deemed appropriate by the IRF. The IRF further reserves the right to revoke a certification if, in the opinion of the IRF, the person concerned has violated or shown flagrant disregard for the professional conduct and ethics that are incumbent to road safety audit team leaders. Since the program is entirely voluntary, the IRF assumes no responsibility for any loss or disadvantage, real or imagined, which may be alleged to have resulted from a disapproval of an application for certification or revocation of the certificate once given.